Donating blood for a cause! 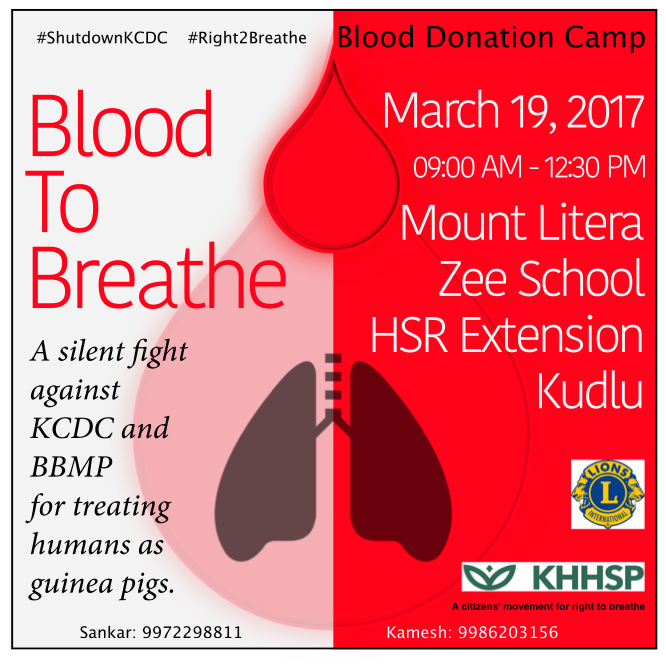 This is the second blood donation camp in Somasundarapalya, HSR Layout, Bengaluru, dedicated for a cause. While the first one was for the Right for Road, this one is for the Right To Breathe. 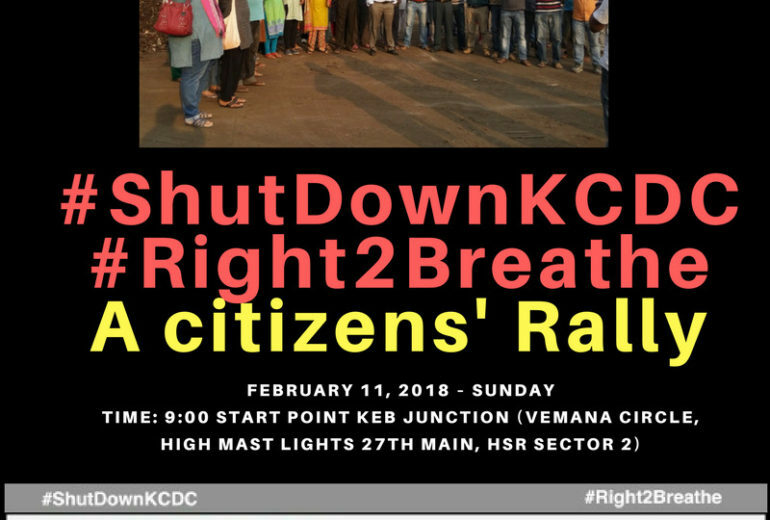 A silent fight against the Karnataka Compost Development Corporation (KCDC) and BBMP for the right to breathe fresh air. The compost plant managed by KCDC is causing severe environmental pollution. The plant, initially designed to handle only 75 tonnes of segregated waste per day, had increased the intake upto 300 tonnes at one point of time based on an Expert Committee recommendation. After several protests by residents in the area, this was reduced. Currently the intake is around 120 -180 tonnes. Almost 55 percent of the intake is mixed waste. Because of the quantity and the nature of the waste, the stench emanating from the plant reaches upto 3 kilometres. The affected area varies depending on the direction of the wind and the weather. 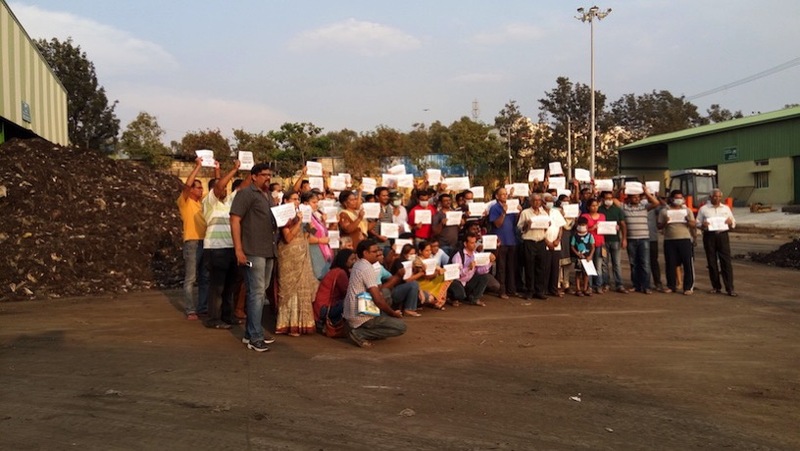 There were several instances where the leachate from the plant was drained to the nearby Somasundarapalya Lake. The plant was started in 1975, but the lake, almost 16 acres and 29 guntas, was there much before the plant was established. While several officials and politicians talk about the 500 meter buffer zone, they conveniently forget, or cover up, the fact that the lake was there much before the plant. From the maps available in public domain, it is evident that the plant has encroached almost 4 acres of the lake. A new road, leading to the side gate of the plant, was made recently by filling the lake bed. Reduce the waste intake to 75 tonnes per day. Do not allow the leachate to flow to the lake and make arrangements to regularly remove the leachate from the premises. Remove all the extra waste stored in the premises and make arrangements to regularly remove the remains and Refuse-derived Fuel (RDF). Regular tests by the pollution control board. A committe with representation from RWAs and associations in Somasundarapalaya. None of the above demands have so far been met to the satisfaction of the nearby residents. Residents are now demanding the closure of this plant alleging severe non-confirmance to the Standard Operating Procedure of the compost plant and also to the general environmental norms.